At one level this is a love story. Daniel is a journalist who has been reporting on the Wars of the Yugoslav Succession. He meets Ljilja, who is an interpreter at the war crimes tribunal at the Hague. One of her professional obligations is confidentiality, she should not speak to journalists about anything she hears. And Daniel’s obligation as a journalist is to report what happens, while protecting his sources. They are attracted to each other, but their professional obligations are in conflict. Once a month a small group of us meet at a cafe for informal discussions of Christianity and literature and when we met last week my wife Val mentioned this book, which she had just finished reading. I’ve already mentioned some of the things that struck her in a report on that gathering here Neoinklings: alienation and otherness | Khanya. One of the bits she read out at the gathering was about the Orthodox monks at Decani in Kosovo, who gave asylum to those fleeing from the violence, and urging people to talk instead of fighting. And that is really what the book is about — the inability to communicate, which breaks down into violence. One of the things that struck me, and which is alluded to in the book in passing, is that at the very time when South Africa was turning from violent confrontation to talking, and abandoning apartheid, much of Eastern Europe was going in the opposite direction. I’ve also dealt with this more fully in this article Nationalism, violence and reconciliation, which I think also gives some of the background story for this novel. And so the book rings true. I recall a member of our church, a school teacher who originally came from Dubrovnik, whose father was an Orthodox priest, saying that people she had grown up with and gone to school with, whom she had regarded as friends and neighbours, would no longer talk to her, no longer answer her letters, because of the hatred being fostered between different ethnic groups. 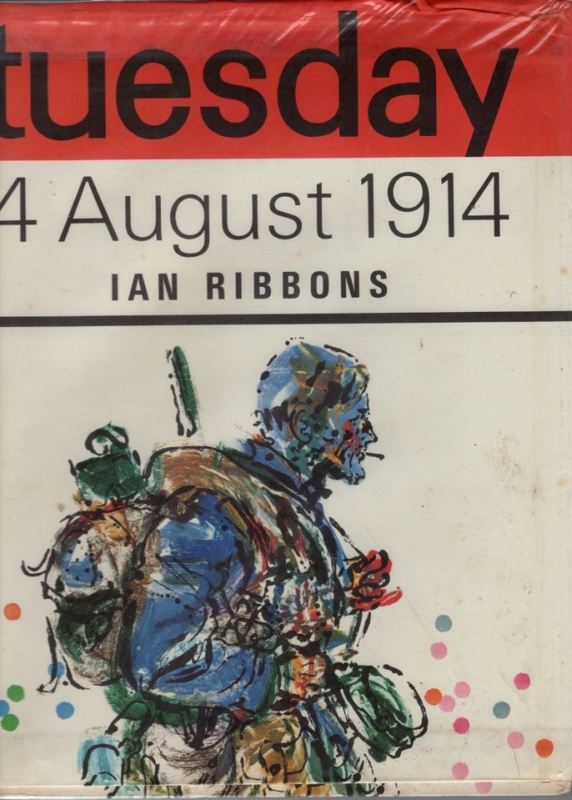 He had felt the cold clear satisfaction of a job done well, the decisive pleasure of colours shifting on a map, the weight of a gun at his waist. But only because it had to happen, there was a force of history behind him, if it had not been him it would have been someone else, anyone else, history would have its way. And I could picture the apartheid apparatchik in his office in Pretoria, looking at his map with satisfaction on receiving a report of these people moved from that area, those people moved to this place, as the territory and its population changed to conform to the Platonic ideal of a map in his office. To be able to say, I will draw this line here, and these people will be on the other side of it. Apart from us. So that we can be alone, and pure and safe, and these people will be the darkness of the other side. No one who has not had this chance could understand the sweep of it. The exaltation. And there it is again, the essence of the unclean spirit of apartheid, exorcised from South Africa, moving to the Balkans, but not excluding the possibility of returning. No, not at all. Quite a controversy seems to have been generated by reports that US presidential candidate Hillary Clinton referred to supporters of one of her rivals, Donald Trump, as a “basket of deplorables”. I would have been content to leave it at that, but then other people started discussing it on Facebook and elsewhere. Political discussions often lead to ad hominem arguments, and one of the boring things about Facebook nowadays is the frequency with which my Facebook friends post ad hominem attacks on the US presidential candidates they don’t like. I usually ignore them and pass on to something more interesting. But what was interesting about this one was that the target of this attack was not a politician, but it was a politician attacking the supporters of a political rival. And what bothered me was that some of my Christian friends on Facebook were defending this and saying it was OK. I think it is decidedly unChristian to call people deplorable. In South Africa we have recently had a controversy about some US “pastor” who appeared to believe that homosexuals were deplorable, and I was amazed at the amount of free and unsolicited publicity that the media gave him. Words can be deplorable, ideas can be deplorable. political policies can be deplorable, but calling people deplorable is the first step on a slippery slope that leads to genocide. Our Lord Jesus Christ did not draw the line at anyone, and if we draw the line at anyone, he will be on the far side of that line and not on ours. Our Lord Jesus came into the world to save sinners, of whom I am first. So if there is any basket of deplorables, I’m right in there with them. So who do I vote for now? Put not your trust in princes, nor in any child of man, for there is no help in them, says the Psalmist. So we should know by now that one can never trust a politician. Entrust them with the government of the country, yes. But don’t trust them. So one is always looking for the least of many evils to vote for. South African politician Julius Malema says the opposition “will run out of patience very soon and we will remove this government through the barrel of a gun” if the ruling African National Congress (ANC) continues to respond violently to peaceful protests. Malema is the commander-in-chief of the Economic Freedom Fighters, an opposition party he founded in 2013 after being expelled from the ANC, where he had served as president of the Youth League. We fought for democracy all those years, only to abandon it now? Come off it, Juju! But then who can one vote for? What are the alternatives? For a long time now I’ve never considered voting for the UDM because its leader, Bantu Holomisa, actually did what Julius Malema is only talking about — he staged a coup in the former Transkei “homeland”. There’s the DA, born of crosstitution, whose former leader, Tony Leon, was urging us to “fight back” against democracy only five years after it had been introduced. There’s Agang, which staged a coup against its own leader so a couple of non-entities could get parliamentary emoluments and pensions even if no one ever voted for them again. I suspect that a lot of people voted for Agang because they thought that its founder, Mamphela Ramphele, had things to say that needed to be heard in parliament. Well, we can see how that worked out, and perhaps that’s something that the people now saying “Thuli Madonsela for president” need to bear in mind. Neither Mamphela Ramphele nor Thuli Madonsela have what it takes to be a successful political leader — the infighting, the backstabbing, the wheeling and dealing. Jake the Fake has that in spades, and comes out of the same mould as P.W. Botha — something worth remembering when people blame our electoral system of proportional representation for the calibre of political leaders who rise to the top. We didn’t have proportional representation in P.W.’s time, but we still got him, even though the media voted for the other Botha, Pik. One of the great theoretical advantages of proportional representation is that if gives one a wider choice, and every vote counts equally. You are not disenfranchised because you happen to live in a constituency that sends the same unopposed member back to parliament year after year. But even under proportional representation, once you’ve crossed off all the people you don’t want to vote for, there’s not much left. I think I’ll just have to learn to COPE with that. Better the Congress of the People party than the Congress of the Guptas party. Owing to the difficulty in using the new user-hostile WordPress editor, this post has been posted on my old blog, here Notes from underground: Row about Rhodes. Interestingly enough, when I opened the editor here to post, up came the new editor with its dreaded “Beep Beep Boop”, so I gave up and wrote it on the old blog. Then when I came back here to put in the link, up came the old, usable editor, so I could perhaps have written it here after all, but by then it was too late. But I can at least put in categories and tags. I was rather puzzled by the sudden popularity of a post on my other blog: Zuma witchcraft story goes viral in right-wing media | Khanya. Lots of people seemed to be finding my blog using search terms like “Zuma” and “witchcraft”. So what were the evil right-wing media up to now? The Daily Sun is notorious for its stories of witches, zombies, tokoloshes and the like, and, to judge by their sales, people love reading about such things. 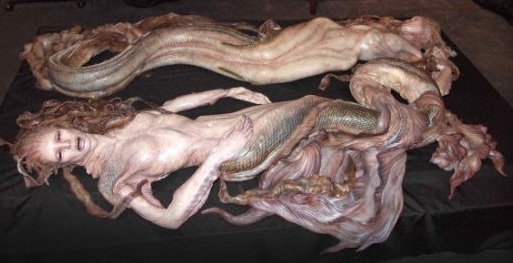 So I did my own search on the search terms that people were using to find my blog, and found that this time it wasn’t the right, but the left — Julius Malema was apparently accusing President Zuma of practising witchcraft by having mermaids in his swimming pool! Who would have thought that Julius Malema would outshine the Daily Sun ? A quick Google search reveals that this story does not seem to have hit the mainstream media yet, not even the Daily Sun , or the UK Daily Mail , but it nevertheless seems to have stirred up enough public interest to promote a significant increase in traffic to my blog. Been through this movie before? I’ve just “shared” three appeals for peace on Facebook — one from a Christian, one from a Muslim, one from a Jew. People say that “religion” is responsible for most of the violent conflict in the world, so how come it is the secular politicians who are fanning the flames of conflict in the world, while is is the “religious” people who are calling for peace? Remember what happened 100 years ago tomorrow? I’ve just been reading about it in this book, an hour by hour account of that day, with what led up to it, and the aftermath. Come tomorrow, when I’ve finished the book, I’ll review it (now finished, review here) but what disturbs me is that nothing has changed. While the world media’s spotlight is on Gaza this week, they haven’t stopped killing people in Syria, Iraq and Ukraine. Three civil wars and a quasi civil war in Gaza. But what are the world’s politicians doing about it? Are they trying to urge the warring parties to get together and try to find a peaceful solution? No, they are grandstanding and making threats against each other, just as they did a century ago. Back then it was called jingoism, and it’s much the same to day. What can ordinary people do to promote peace when the politicians of the world’s most powerful nations are in the driving seat and driving in top gear to hell? Henry Siegman, Leading Voice of U.S. Jewry, on Gaza: “A Slaughter of Innocents” | Democracy Now! What are other countries doing? Supplying arms to the combatants, that’s what. The Church is concerned that much of the rhetoric appearing in the media is biased and ill-informed; based upon the geo-political aspirations of certain stakeholders, which can only lead to further conflict and, God forbid, outright war. Former German chancellor Helmut Schmidt said on Friday the Ukraine standoff recalls the lead-up to World War I and blamed the “megalomania” of EU bureaucrats for sparking the crisis. For the moment, these are separate conflicts, but remember that the Second World War started when a lot of separate smaller conflicts coalesced into one big one — Italy versus Ethiopia, Japan versus China, Germany versus Poland. And suddenly it became a free-for-all. Can we learn the lessons of history, before it’s too late? A few months ago I noted that Mamphela Ramphele had let down her supporters by seeking an alliance with the DA. 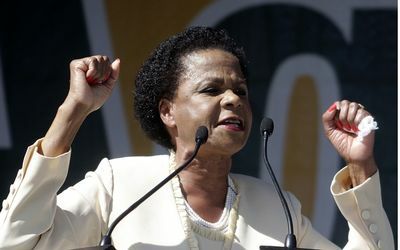 In a letter published on Agang’s website, Dr Ramphele, who founded Agang in 2013, said she would be handing over the Parliamentary reins to the party’s national youth forum co-ordinator Nyameka Mguzulo and chairman Mike Tshishonga. I suspect that many of those who voted for Agang in the general election last week did so because they wanted Mamphela Ramphele’s voice to be heard in parliament, and would not have been too disappointed that Agang won only two seats, in parliament, provided that one of them would be occupied by the party leader. 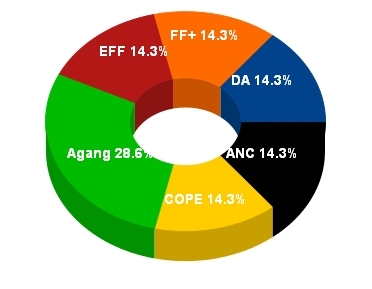 Agang was too new for many people to vote for the party on it’s policies or its record. Few people knew anything about it apart from the public utterances of its leader. If Mamphela Ramphele had gone to parliament and played a useful role there, perhaps Agang might gain more support at the next election, but without Ramphele in parliament it will probably disappear more quickly than Cope. South Africa (and probably many other countries) has had no shortage of leaders, like Jacob Zuma and P.W. Botha, who are adept at political wheeling and dealing, but have no vision of where they want the country to go. It seems that Mamphela Ramphele is at the opposite extreme — plenty of vision, and seeing what is wrong, but totally lacking in the kind of common sense needed in practical politics. Somewhere there must be a golden mean between the wheeler dealers and the impractical idealists, but Mamphela Ramphele evidently isn’t it. When she was Principal of the University of Cape town she had some pretty good things to say about education policy. Saying them in parliament, not just in debates, but in committees etc, could have had a beneficial influence 9n education in the country. I also suspect that, in addition to those who thought she said things that needed to be heard by those in government, she may also have drawn some of the residual Black Consciousness votes that might otherwise have gone to Azapo. Historians may argue about the role that Black Consciousness played in our history, but there can be no doubt that it did play a role, and perhaps its voice still needs to be heard, and Mamphela Ramphele could perhaps have been that voice too, but no, she’s pulling out. Two very serious tactical errors in less than six months — I think her “break from politics” will be permanent. The short-lived romance with the DA was disastrous, because I suspect that many people who were thinking of voting for Agang were thinking of doing so precisely because they did not want to vote for the DA (at that stage I was one of them). They had second thoughts then, and Agang no longer seemed like a possibility even after the romance was broken off. I suspect that many of them voted for the EFF instead. In theory our proportional representation voting system should give one lots of choice. There are lots of parties to choose from, and if any of them get 0,25% of the votes they get representatives in parliament. Unlike a constituency system, there are no unopposed or safe seats, where you have no vote or a wasted vote. Every vote counts. But I still find it difficult to decide. What I do when following news of elections in other countries is to take one of those quizzes that you find on various web sites, where the quiz is designed to match your expressed values to the policies of one of the parties or candidates. For example, in the 2012 US Presidential election, I did one of those quiz thingies, and at the end it told me that if I had a vote in that election I should cast it for Jill Stein. I’d never heard of her. But you can read about it in American elections: rhetoric and reality. But I couldn’t find any similar quizzes in South Africa, until I came across this one, sponsored by City Press. Play: Who deserves my vote. It’s pretty clunky and unsophisticated compared with the overseas ones — instead of matching your expressed values with the manifestoes of the parties and statements by the candidates, they just give you chunks of the manifestoes themselves, and ask you to pick the ones you like the most. At least it might give me a clue about which parties I should look at more closely before decided which one to vote for. The answer? All of them. Well, nearly all of them. That’s not much help, is it? The percentages in the graphics also seem to be a bit inconsistent, though the trend is clear enough. But of course policy manifestoes are not the only criterion. There are other co0nsiderations, like their historical record, how much you trust their leaders, and so on. I’ll cross Cope off the list for a start. They seem to have spent most of their energy since the last election in internal party squabbles with various leaders taking each other to court. If they can’t manage their own party properly, there’s little hope that they will be able to manage the country. Then there’s the ANC. But they seem to be living on past glory. Yes, they had a good story to tell — 15-20 years ago. But the recent past looms larger, and three things stand out: Marikana, E-tolls, and Nkandla. And that procession of very expensive cars in ANC colours doesn’t help; too much bling, angling for the IziKhotane vote, perhaps? Thanks, but no thanks. The FF+? They seem too much like a retreaded version of Andries Treurnicht’s old Conservative Party to me, still standing for sectional interests, and even many of those who might in the past have identified with those sectional interests seem to prefer to throw their lot into a wider South Africanism. EFF. The wrong party at the wrong time. If Cosatu had broken from the tripartite alliance and started a Labour Party, I’d be interested. But the EFF looks a bit too much like fat cats selling snake oil to the poor. The sight of Julius Malema leading a march from Joburg to Pretoria from the back of a bakkie seems to sum things up. They say some good things, and some incredibly silly things that they don’t seem to have thought through. But I might, just might, consider voting for them at provincial level. That wouldn’t help Juju get into parliament, but I suspect that they might have some good people on their provincial lists. Then there’s the DA, the Democratic Alliance. They have several stories to tell, one good, the others middling to bad. They’ve been telling us that they fought apartheid. Well some of their ancestors did, and some of their ancestors introduced apartheid, so those seem to cancel each other out. I’m also suspicious of political parties that promise jobs. The ANC used to do that too. Politicians who promise jobs usually end up giving jobs to pals. And after the Democratic Party’s “fight back” campaign in 1999, to attract those of the white right who were gatvol after five years of democracy, which enabled them to absorb the rump of the National Party which had fought against democracy for 40 years and more.. well, that isn’t easy to forget. But, like the EFF, I might, just might, consider voting for them at the provincial level. Which has the biggest chunk of the teething ring, the only one that got more than the other parties. I was pretty sure I would vote for them until Mamphela Ramphele shot herself in the foot by toenadering with the DA. But even though she’s blotted her copybook, what’s the alternative? I still think she could make a useful contribution in parliament. So the City Press quiz, plus thinking aloud, as it were, in this blog post, is all part of the process of trying to make up my mind about where to put my cross come Wednesday. I’ve more or less decided where I won’t put it. I’m even less sure about those than I am about the City Press ones. I thought the UCDP was Mangope’s party, and I have a kind of built-in distrust of former “homeland” leaders, especially those who opted for “independence”. But maybe I’m missinformed about that. I’ve never heard of the People’s Alliance before, and I hope it isn’t the sushi king party! 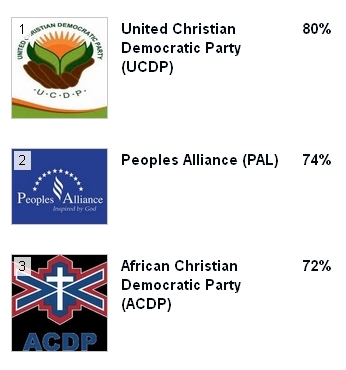 I know of the ACDP, but would not vote for it for reasons explained in the comments below. I’m also pro-life, and so would prefer to vote for a party that is against both capital punishment and abortion. Well, now you can try both these tools to help you decide which party to vote for! 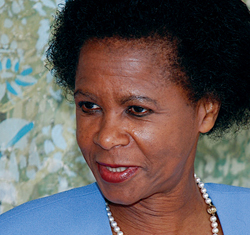 Has Mamphela Ramphele betrayed her supporters? About 18 months ago I had a poll on this blog and asked readers who they would like to see as President of South Africa, and 80% of them voted for Mamphela Ramphele. It did not seem likely then, as she didn’t seem to be the kind of person who had time for the political wheeling and dealing needed to get to be President of the ANC, which was the only way to become president opf the country. But then she started her own party, Agang, and that seemed to offer at least the opportunity of getting her into parliament. One-woman parties don’t have a good record of gaining power in South African politics, but when their leaders got elected they did say things that no one else in parliament was saying, and that needed to be said — Helen Suzman and Patricia de Lille, for example. Mamphela Ramphele, unlike most of our politicians, seemed at least to have some vision. So I was seriously thinking of voting for Agang in the next election. Then came the news that Mamphela Ramphele had decided to throw in her lot with the Democratic Alliance, and I suppose that leaves me with little option but to vote for Julius Malema’s Economic Freedom Fighters (EFF). Johannesburg – Supporters of Agang SA leader Mamphela Ramphele were doubtful on Tuesday about voting for the DA, following the announcement that she was the party’s presidential candidate. “As much as I want Mamphela to be president I don’t think I can get her there by voting DA,” said Agang SA supporter Tlaleng Maseko, of Johannesburg. DA leader Helen Zille announced on Tuesday that Ramphele would be the party’s presidential candidate in the upcoming general elections. She said talks between Agang SA and the DA had been going on “continuously”. Perhaps there are many different worlds, and whether they can communicate with each other, I don’t know. All I can say here is how it looks to me. I thought Mamphela Ramphele was someone with vision and integrity, and that by joining the DA, a party with a very chequered history, she has compromised both. If she were elected to parliament as the leader of a party, no matter how small, whose policy was largely shaped by her vision, she could express independent views and bring fresh ways of seeing things. Now she has joined a party whose policy she has had no part in shaping, and if she is elected to parliament, she will need to follow that party’s line. So the move looks a bit opportunistic to me, and that does not say much for political integrity. And the Democratic Alliance is also much too opportunistic for me. They recently tried to cash in on the death of Nelson Mandela, and tried to claim that they represented his ideals. But let us not forget that their immediate predecessor in that chequered history of theirs, the Democratic Party, at the end of Nelson Mandela’s only term as president, appealed to the electorate who were “Gatvol” and urged them to vote for the DP to “fight back” against Nelson Mandela’s ideals. The DA also likes to claim that “we fought apartheid too”, but conveniently forget that because of their composite nature, they were also the party that brought us apartheid, because the DA was formed by the alliance of the Democratic Party and the rump of the National Party that brought apartheid into being. So part of that chequered history is that some of the DA’s predecessors fought apartheid, but others of them introduced it in the first place. Yes, one of their predecessor parties, the Progressive Party, symbolised by Helen Suzman, for a long time its only MP, did fight against apartheid, but a more recent leader, Tony Leon, led the “fight back” against democracy, which tends to cancel it out. In the 2009 election many had great hopes for COPE, the Congress of the People Party, but it has wasted most of its energy ever since in internal leadership squabbles. For the 2009 election they brought in a neutral candidate, Mvume Dandala, but he failed to stop the fighting and COPE fell apart. And I wonder if Mamphela Ramphele will perhaps turn out to be the DA’s Mvume Dandala — brought in at the last minute to a party whose policy she did not help to shape. Only time will tell. All I can say is that her joining the DA has not made me think any better of the DA, and has made me think a lot worse of her. And if the article quoted above is anything to go by, quite a lot of Agang supporters feel the same way. She raised their hopes and dashed them. So I, for one, do think she betrayed her supporters. During the past week the Democratic Alliance (DA) appears to have been trying to rewrite history and rehabilitate its past, including a Twitter campaign with the hashtag #KnowYourDA. This has prompted others to use the same hashtag to denounce the DA. One of the more controversial elements of the campaign was this pamphlet, quoting Nelson Mandela, the leader of the ANC, praising Helen Suzman, one of the leaders of the Progressive Party. The Progressive Party was the great great grandmother of the DA. If you know anything about family trees you will know that each of your great great grandparents contributes about one sixteenth of your DNA. The pamphlet appears to be trying to tell a different story, with Helen Suzman as Mummy and Nelson Mandela as Daddy of the DA. It wasn’t like that, and it still isn’t like that. Check where the other fifteen-sixteenths of the DA’s DNA really came from. The Democratic Alliance was formed out of a campaign, led by one of its components, the Democratic Party led by Tony Leon, to unite the white right during and after the 1999 General Election, under the slogan “Fight back”. Their campaign posters were clearly aimed at appealing to those who were “Gatvol” with five years of democracy, and wanted to fight back against it to restore the status quo ante. After the election the united with the rump of the National Party (the party of apartheid, the former political home of most of the white right), and in order to do so introduced the thoroughly undemocratic practice of “floor-crossing” into parliament. That turned round to bite them when some of the former leaders of the National Party found the Democratic Alliance too right-wing for them, and themselves crossed the floor to join the ANC. While this effort to whitewash the DA is reprehensible, some of the comments to counter the DA campaign are equally reprehensible. Some people are trying to counter it by attacking Helen Suzman, and trying to show that she was evil. But Helen Suzman was not responsible for this pamphlet, nor for the misuse of her photograph and the words of Nelson Mandela. I think Nelson Mandela’s words were sincere and genuinely meant, and for the most part true. What is bad is the DA’s dishonesty in trying to claim the credit. I was one of those who voted for Helen Suzman in 1961. The Progressive Party had broken away from the United Party two years previ0usly, and she was the only one of their MPs to be re-elected. It was not perfect, and it did not have a perfect policy. But after 13 years of apartheid, and the relentless efforts by the National Party to create a race-obsessed society, the Progressive Party opted for a different policy. They switched the focus from race to class. The National Party wanted to ensure that only whites could elect representatives to parliament. They removed black representatives. They were in the process of disenfranchising coloureds, and their aim was to have an electorate defined by skin-colour. Only whites were to be able to vote. The official opposition, the United Party, were lukewarm in opposing this, and so the “progressives” left. But they did not join any of the several parties and movements that advocated “one man, one vote”. They still wanted a limited franchise, only it was to be limited by class, not race. In their policy, anyone of any race could vote, as long as they were rich and educated. Property, income and education were to be the criteria, rather than race. But Helen Suzman’s significance was far wider than her party’s restrictive class-based franchise policy. She spoke out against the Natoinal Party’s increasingly totalitarian jackboot rule at a time when few others did (and most of those who did were detained, or banned, or harrassed by the police). And she was the only one who did so in parliament, where she could not be silenced. But when, after several political marriages of convenience, in which the Progressive Party became the Progressive Reform Party, the Progressive Federal Party and then the Democratic Party, it finally, after the 1994 General Elections, held aloof from joining the Government of National Unity led by Nelson Mandela. 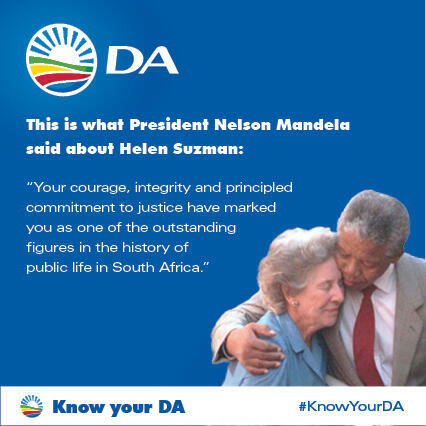 If the DA had joined the GNU, there might just have been a grain of truth in the picture of Nelson Mandela and Helen Suzman together on the DA pamphlet. But as it is, it is lying propaganda, which deserves all the contempt that has been poured upon it. Instead of trying to reinvent the past, the DA would be better occupied in trying to rebuild the future. As for me, I’m still waiting for Mamphela Ramphele to bring the train to the station. The DA is not the only one to twist history here. In 1960 there were three political parties that stood for “one man one vote” and were also themselves nonracial: the Communist Party (which had been banned since 1950) the Liberal Party, which had been formed in 1953, and the Pan African Congress (which was banned in 1960). The Congress movement — the African National Congress, the SA Congress of Democrats, the Indian Congress and so on — was made up of racially exclusive bodies. Rica Hodgson, a member of the Congress of Democrats, recently tried to blacken the name of the Liberal Party by saying that it did not allow blacks to join, whereas it was her own organisation, the COD, that was all-white. But whether one tries to blacken the name of other organisations, as Rica Hodgson did, or whitewash one’s own, as Hellen Zille is doing, it is still distorting history.